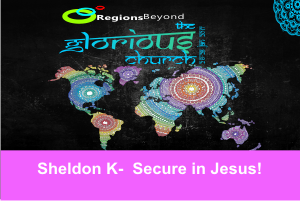 Glorious Church, RegionsBeyond Conference 2017 held in Mumbai. Q. Do you know the call of God on your life? Are you prepared to do what it takes to fulfil that call on your lives? We need to understand that there is a false self and a true self. The false self is also called your super-self because that’s the self you want people to see. I’m going to speak about identity. We have to respect who we are. We don’t preach self-esteem. That’s just security in who you are. You are made the way you are, but identity is a deeper rooted thing. It brings you security, confidence and is rooted in Jesus. It starts internally. If you want to have freedom and live from a place of freedom, it starts inside of you. Then it bubbles up in the external. This whole life we live, goes a deeper to one day when we stand in heaven waiting to hear, Well done, good and faithful servant. What’s deeper than that is that we will have a father waiting to say welcome home my son/ daughter. Divine power and divine nature- two stories in the Bible- Peter and Adam and Eve. In 20-30 years time, you guys who are in the front, you’ll be at the back and your children will sit here. It will happen because we’ll grab a hold of it. About 20 years ago, I had an encounter with God at a Sunday night meeting and God broke my heart for the church. I broke down! It was tears of pain because he gripped my heart for the church. Revelation is not head knowledge. It’s a deep understanding that God gives you about something and it cannot be stolen from you. I had the honour of taking over the leadership of the church from him. For 20 years I served him and in the midst of that God raised me up. We need to be willing because you are the future church leaders. You will go out and do great things for God. There are many temptations in this world right now- many things that look like they satisfy you. But God is testing this generation because he is seeing if you are ready for a mighty outpouring. Are you willing? Q. Do you get saved into the church or into the Kingdom of God? You get saved into the kingdom. It’s like the United kingdom which is under the Queen. Now, a British person does not have access to the Queen. We are part of the kingdom that is unseen. Giving your life to Jesus means being adopted into his family. The vehicle used to expand this kingdom is the Church. Seek first the kingdom of God and his righteousness. Peter was the apostle who spoke before he thought. He walked on water, and saw phenomenal miracles at the hand of Jesus. He received revelation about Jesus being the Christ, the Messiah. On this revelation, Jesus said he will build his church. Luke 22: 31- 32 “Simon, Simon, behold, Satan demanded to have you, that he might sift you like wheat, but I have prayed for you that your faith may not fail. And when you have turned again, strengthen your brothers.”” Then he goes on to tell him that before the rooster crows thrice he will deny him. But Jesus is giving a little hint here- that he prays his faith will get him through. We know what happens after this. Peter is standing there and when asked if he knew Jesus, he denies him. In verse 61- the Lord turned and looked straight at Peter. He then went outside and wept bitterly. He let his greatest friend, his saviour down. How do you come back from that? He felt deeply guilty. He felt great shame. Now we go right back to the beginning in the Garden of Eden. There was no sin. They was no need to talk about self esteem and security. God gave them one command- not to eat from the tree of the knowledge of good and evil. We know how the story goes. The one thing they did is that they disobeyed what God said not to do. In that moment they lost their innocence of consciousness. All of a sudden they were aware of good and evil. Before that they were only aware of good. What started was a plan of showing who God is from a place of brokenness. We cannot be innocent in our own strength. From the Garden of Eden, striving hard to please God, the law fell short. Jesus the saviour came and by his perfect blood all our sin, guilt, shame is gone. His perfect love casts out fear. His divine power- this is beyond this world, it’s powerful. This is given to us so that we can participate in his divine nature. Before you knew Jesus, you have a sinful nature. But now you have a divine nature. You are perfect before God. you are being made holy. There is justification- that the mercy of God has paid for your sin; and sanctification- that you are being made new. Nothing is holding you back from running hard for the things of God. Not even the enemy lying to you. Make sure your Election and calling. When you have security in your identity in Christ, you can stand strong as a child of God against the evil schemes of the enemy. It is an understanding of who you are in Christ. We need to be secure. Any hint of insecurity, guilt and shame, fear- the enemy rushes in like a flood. But our king has raised up a standard against him. Now you are free. When we go to the world secure, they will see the love in our hearts. It’s not a love we’ve worked hard for. It has been freely given to us- to do incredible things on earth.